Eventually we will host the application on the Microsoft Azure website, and we’ll use Visual Studio IDE to develop the application. You can see the real time chat application we are going to build in this article live at: http://igchatapp.azurewebsites.net/chat.html . Feel free to chat with us at this URL! Register on https://www.firebase.com/ and login to access the Firebase portal. In the right hand side, you’ll find the option to create a new app. 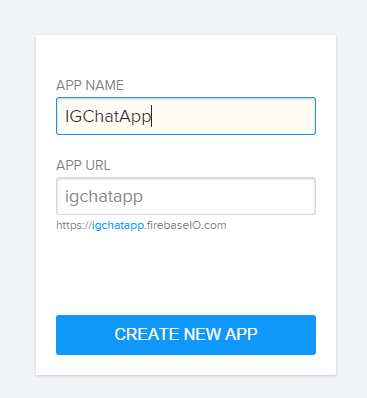 Give your app a name and the URL to create a new app in Firebase.